So, yesterday was Burn’s Night: an event which became a mild obsession ever since I was fortunate enough to taste this iconic Scottish dish: I’ve always loved Scotland and the Scottish people and this has further fuelled my enjoyment and recognition of this day. I don’t profess to know much about Robert Burns except that he was in effect the national poet of Scotland. 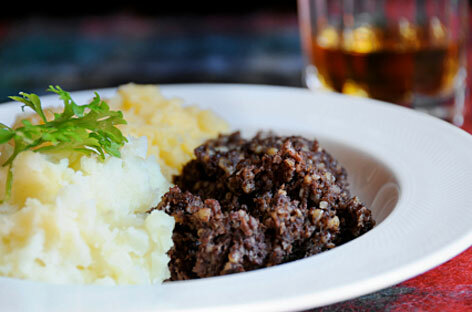 Burns Night, held on his birthday, celebrates his life and work and Haggis (with tatties and neeps – potato and swede) is usually eaten as part of the Burns supper, after the recitation of the Address to a Haggis. A wee dram or two may be imbibed in the process, bagpipes, you get the picture! So what is this haggis, is it the mythical wild beastie with different sized legs of yore? Why am I so obsessed with it anyway? Well, like many of our most treasured recipes today, it is ostensibly a peasant dish. Man is a survivor, and for most of our history, food has been a large part of that. To think that many dishes that our ancestors created out of necessity and survival could also be so delicious that they are still eaten in today’s gluttonous times is amazing. To find that much of that food too, is incredibly good for us is a gift indeed. I know: many of you probably exclaim in horror at the mere mention of this exotic dish. It’s outside of your comfort zone: it’s not ‘safe’ like a bland, textureless chicken breast. The fact that such culinary exoticism does exist in the UK endears me even more to all of those wonderous lesser-spotted haggii out there. I know, I know: it’s full of lots of nasty offal. It’s a sheep’s stomach (the casing is artificial these days) filled with its lungs, heart, liver plus oatmeal, onion, stock, suet and lots of lovely spices. I too, many years ago, before losing my haggis virginity, harboured much suspicion of this dish which hailed from the other side of Hadrian’s wall. The concept of haggis was as alien and incomprehensible to me as the most hardy of Glaswegian dialects. I was so glad when I tried it: I couldn’t believe how spicy it was, the richness of the meat, oatmeal, fat combined gives a satisfying umami-filled mouthfeel. It’s interesting to note that the 10 million or so Americans of Scots heritage who want to eat authentic haggis basically can’t. In 1971 the US banned sheep lungs, a key part of an authentic haggis, and in 1989 the US banned all UK meat products following the BSE scandal, so they have had to rely on an inferior local approximation. The humble haggis has become very popular outside of Scotland and has been taken out of context to create a whole host of wonderful products. In the past I have had the pleasure of eating buffalo and haggis burgers which are a complete delight and last night I had an incredible starter of venison and haggis ravioli with kale in a delicious broth. Its spicy notes mean it marries well into an east-west fusion. In Edinburgh/Glasgow the numerous Punjabi diaspora took it for their own in the form of haggis pakoras, and in London you can find haggis dim sum. For those who just can’t ‘stomach’ this dish, or don’t do flesh, I suggest going for the veggie version. Vegetarian haggis is the perfect balanced vegetarian main, which tastes great even to non-veggies, and has an excellent nutritional profile. The typical vegetarian haggis has mushrooms, various vegetables (often carrots and onion), vegetable stock, lentils, nuts, veggie stock and the obligatory oatmeal and spicing. I have done my bit to wax lyrical about the humble haggis, but I leave the last word on haggis from the master, Rabbie Burns himself.